Aladdin, from Hollywood, California, was founded in 1945 by Eddie, Leo and Ira Mesner and was initially called Philo Recordings. In April 1946 it became Aladdin. The label had several subsidiary labels such as Score, Intro, 7-11 and Lamp. The Mesners sold the entire Aladdin catalog to Lew Chudd’s Imperial Records on February 12, 1962. The 2000-series started with #2001 and ended with #2040. Most of the missing numbers in this series are unreleased, except for #2006, which is a secular release by Al Hibbler. 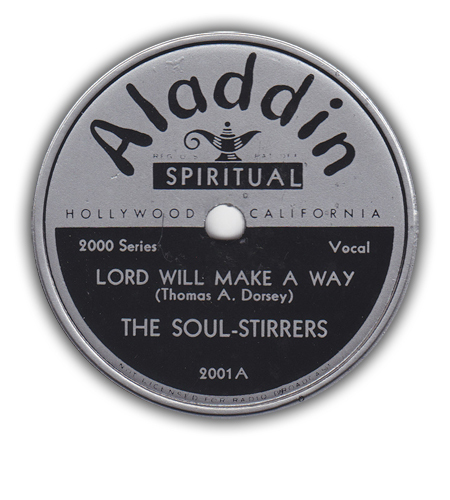 Gospel acts who recorded for Aladdin but didn’t have anything released, include the Gospel Stirrers, Rev. Alex Mims and the Virginia Sons Of Harmony. This page lists all known Aladdin gospel releases. Likely, none of them were released in the 45rpm format.